UNRWA CONDEMNS PLACEMENT OF ROCKETS, FOR A SECOND TIME, IN ONE OF ITS SCHOOLS | Petition: Hamas leaders to trial for War Crimes - SIGN! Earlier this week UNRWA issues a statement regarding a second case in which a UN school in Gaza is exploited by terrorists to hide rockets. 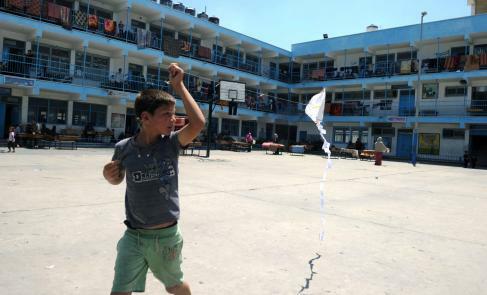 Although the school was vacant, it was located between two other schools which currently house 3,000 Palestinians. For the complete statement click here. The previous case in which UNRWA discovered missiles hidden in a school happened just 5 days before this one. UNRWA returned the rockets to the Hamas. 1. Two cases of proof that Hamas uses civilian facilities and civilians as human shields. 2. Two cases, just 5 days apart, where a global relief organizations finds rockets in civilian buildings. Putting civilians at risk, knowingly and on purpose, is a war crime. It is time to put an end to this and bring Hamas leaders to war crimes.